"Ambassador Jeffrey will lead and coordinate U.S. Department of State relations with the Global Coalition to Defeat ISIS and Department efforts to implement President Trump's announcement of a responsible U.S. troop withdrawal from Syria that is coordinated with our global Allies and partners consistent with U.s. goals for Syria and Iraq, including the enduring defeat of ISIS," Palladino said in the release. 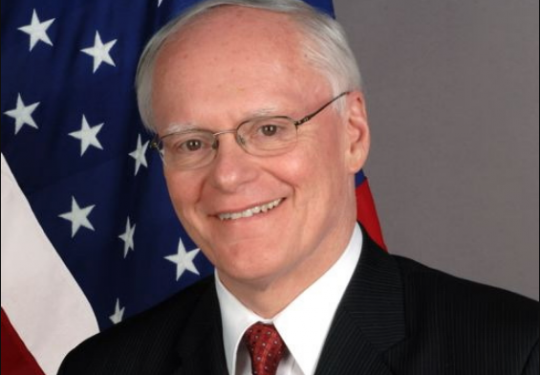 Jeffrey has also performed duties as deputy national security advisor (2007–2008), United States ambassador to Turkey (2008–2010), and United States ambassador to Iraq (2010–2012). From 1969 to 1976, Jeffrey served as a U.S. Army infantry officer, in Germany and Vietnam. This entry was posted in National Security and tagged Brett McGurk, Donald Trump, ISIS. Bookmark the permalink.